This is not an exhaustive list of all the bathroom partition options we carry, but it serves as a convenient quick reference guide for some of our most commonly purchased items. A complete list of all our options can be obtained by emailing or calling our head office. As many facility managers are operating on tight budgets this year, we include a line of painted metal commercial restroom partitions. These partitions will work very well in a normal use, low or medium traffic environment. Bear in mind, however, that they offer little resistance to scratching or impact. In the event they are subjected to rough use or vandalism, they will need to be repainted or replaced. Many have budget conscious plastic hinges, and they carry a Class A Interior Finish Fire Code rating. At a slightly higher price point, HDPE plastic offers a cost-effective solution for higher traffic environments. Common applications include restrooms in schools, gyms, and natatoriums. Plastic is highly resistant to moisture and can also be used to construct shower stalls in commercial restrooms. Partitions made from plastic, however, can be scratched by vandals and dented through heavy usage. Repairs can be conducted on these partitions, however, making replacements less frequent than painted metal equivalents. HDPE does not meet NFPA 286 standards but does have a sufficient fire resistance to meet many regulatory codes. Phenolic is ideal for the restroom environments with consistently high traffic. It is highly scratch and impact resistant, and graffiti written on its surface can be quickly and easily removed. It carries both Class A and Class B Finish Fire Code Classifications. Of all the materials we furnish, SCRC is the most impact and scratch resistant. It features complete graffiti removal and is the ideal choice for any restroom that suffers frequent vandalism. Stainless steel commercial restroom partitions carry the highest price point on the market because of their high-end aesthetic. Most architects choose stainless steel for the upscale, contemporary look they contribute to design. High-rise office buildings, fine restaurants, and hotels require a certain level of design to set themselves apart, and stainless steel helps establish this differentiation. Stainless steel carries a Class A Interior Finish Fire Code Classification and is an ideal choice for any new construction where looks play a key role in the customer experience. 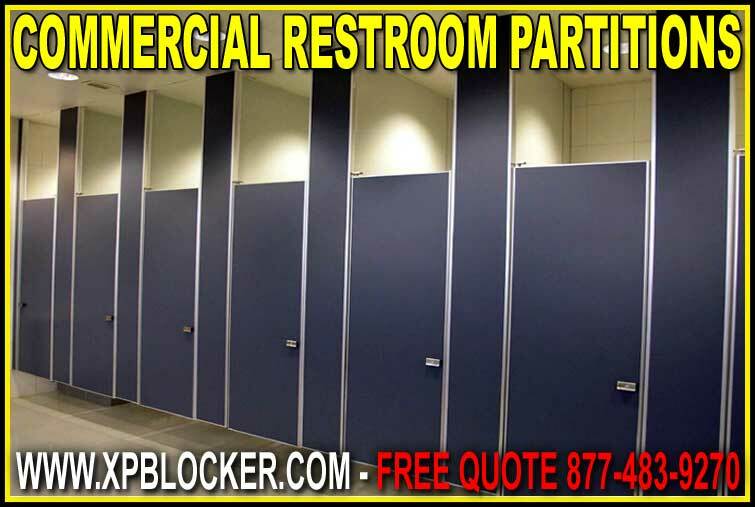 XPB Locker has decades of experience working as both a vendor and an installer of commercial restroom partitions. We are more than willing to help with drawings, consult on measurements, and help determine the best color and mounting options for your applications. Send us your drawings, and call us today.